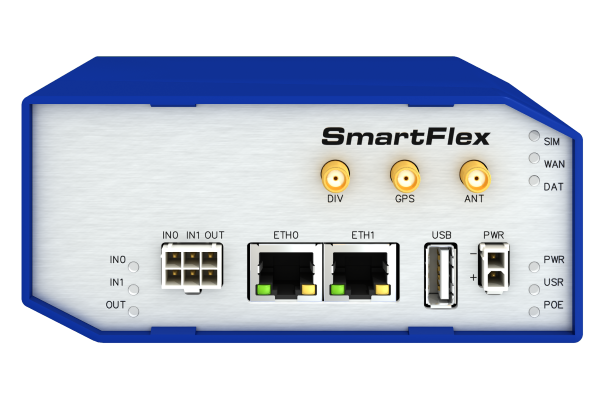 SmartFlex SR304 is an industrial cellular router intended for the market in Europe, Middle East and Africa (EMEA) area. However, it can also be operated in Latin American (LATAM) and Asia Pacific (APAC) markets. This router is an ideal device for wireless communication in mobile networks that make use of LTE, HSPA+, UMTS, EDGE or GPRS technology. Due to the high speed of data transfer up to 150 Mbps (download) and up to 50 Mbps (upload) is this router an ideal solution for specialized M2M devices and IoT as well as for wireless connection of traffic and security camera systems, individual computers, LAN networks, automatic teller machines (ATM) and other self-service terminals. The standard configuration includes two Ethernet 10/100 ports, one USB 2.0 Host port, two binary inputs and one output (I/O connector). The device also has two readers for 3 V and 1.8 V SIM cards, which are located on the rear panel of the router. The router also includes a microSD card port that supports up to 64 GB card storage (32 GB in the case of SDHC cards). The router can be equipped with a WiFi module, but this must be part of the initial configuration – it cannot be added to the router at some point in the future. The router can be equipped with PoE PD (Power over Ethernet – Powered Device), which allows the router to be powered via Ethernet. It can also be equipped with PoE PSE (Power over Ethernet – Power Source Equipment), which lets the router power other devices via Ethernet. 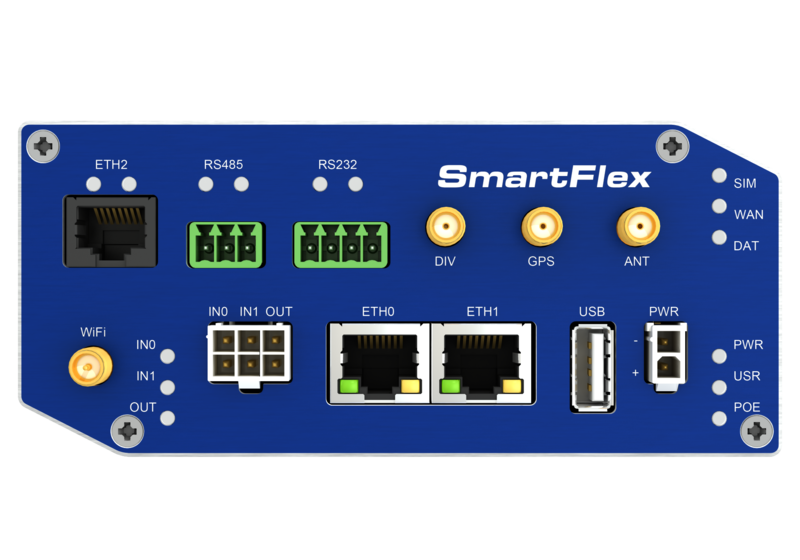 The SmartFlex can also be configured with a wide variety of port options. These can be SWITCH – three switched Ethernet ports; RS232-RS485/422 – combination of serial interfaces; RS232-RS485-ETH – combination of serial interfaces and Ethernet port with higher insulation. The router can be provided in either a plastic or metal casing, depending upon the customer’s requirements.